Jacquard is a French weaving technique that combines multiple criteria to obtain reversible designs embedded in the linen. This is already a top quality for this item that combines the superlatives. When the jacquard meets the Provençal experience, it highlights even more sought-after motifs, worthy of ancient Indian fabrics. Marat d'Avignon revives these wonders by bringing a very jealous care to their confections. Durance is a refined, majestic collection, as the river that irrigates an immense fertile plain of northern Provence. The table top is just dotted with spaced florets, in the middle of which are interspersed lots of points grouped by four, and barely visible. These are typically Provençal. The drop is decorated with multiple friezes of different thicknesses and patterns. There are two friezes of calissons and a large floral frieze. The subjects stand out in lighter color for the colored backgrounds, and slightly darker for the clear backgrounds. The colors are exquisitely soft, which highlights the encrustations of the fabric. A pure delight! The white color of the Durance collection is particularly elegant: it is perfect for setting up reception tables, be it a wedding or a baptism, or perhaps a communion party. Wherever the white must symbolize purity, this square tablecloth is all indicated. The round format is also available to dress guest tables while keeping harmony. The jacquard relief will add nobility to the elegance of white. We highly recommend this article for all chic receptions. The matching napkins are also available as accessory. 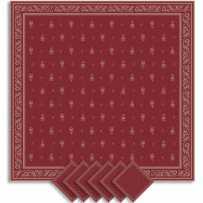 These are square cover (mat), table runner, and beautiful rectangular placemats. The Durance collection will seduce you for sure.